Urns in Style, a leading purveyor of highly-curated cremation urn collections, has published a fascinating and heart-warming interview on its website that tells the story of how the company was recently commissioned by a bride-to-be to create a special, customized cremation urn as a wedding gift to share eternity with her fiancé. 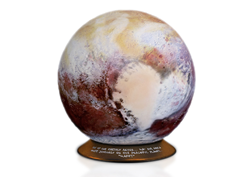 A custom cremation urn, planet Pluto, designed to celebrate eternal love. The interview, which is titled “Death Won’t Do Us Part” is available at http://www.urnsinstyle.com/custom-urns-planet-pluto-interview.aspx. It reveals Maryrose Forsyth’s journey in deciding on cremation and funeral pre-planning, and how a custom-made cremation urn for ashes was designed to symbolize the “after-life” destiny she and Peter, her beloved fiancé, wanted to share together. With that goal in mind, Urns in Style worked closely with Maryrose to craft a custom urn designed to resemble the planet Pluto; Maryrose and her fiancé Peter were captivated by the “heart” that has been discovered as a pattern on the actual planet, and the urn was designed to hold the ashes of both Maryrose and Peter. For all other information including media inquiries, contact Michi Kustra at (888) 506-2685 or contact(at)urnsinstyle(dot)com. Urns In Style is a leading purveyor of highly-curated cremation urns in the market, and is committed to providing superior choices in aesthetic design and quality. Because the company believes in the importance of a cremation urn that distinctively celebrates and personalizes a loved one's life, its cremation urns are created by handpicked artists to be truly one-of-a-kind, exclusive offerings. Urns In Style also offers “Design your own” services through its vast network of artists in all different art disciplines and materials – from ceramic, wood, to metal and glass. The company provides a wholesale program for funeral directors, funeral product and service distributors, and other funeral industry professionals.